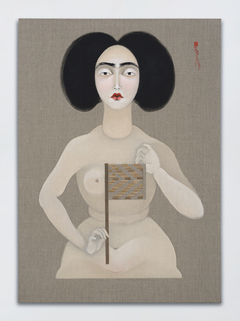 For more than a decade, the Baghdad-born, Los Angeles–based artist Hayv Kahraman has been making paintings in a style that is unmistakably her own, mixing elements of Persian miniature and Renaissance portraiture with a vaguely Japanese aesthetic. She works on raw linen and leaves ample space untouched. She paints women with ghostly white skin, red lips, strong brows, and calligraphic shocks of black hair. The figures in painting after painting always appear to be the same person, with subtle variations. Kahraman has arranged them into sacrificial scenes; cast them as evil marionettes; as one waxing the mustache of another. Her levels of humor and pathos go up and down. But one may reasonably wonder to what extent Kahraman is repeating herself, getting stuck in her subject. She offers a striking answer—and a way forward—in this show. Risking the total destruction of her work, Kahraman has lately taken to delivering her paintings to a facility in the garment district of Los Angeles, where they are systematically shredded and returned to her in strips (Strip 1, for example, all works 2017). She has cut the linen of one painting and woven it into another (in the series “Mahaffa” and “Mnemonic Artifact”), emulating the pattern of a braided palm-frond fan, which was one of the only sentimental objects her family packed into a single suitcase when they fled Iraq in 1992, traveling through Africa and the Middle East on false passports before settling as refugees in Sweden. Her furthest departure yet is a pair of near abstractions, T25 and T26, made from pamphlets that were distributed to US soldiers in Iraq, ostensibly guiding them, via pictograms, to understand a few phrases of Arabic and Kurdish for a hearts-and-minds campaign—or, more accurately, teach them the vocabulary of war.